Helen Tipton Service Details - East Liverpool, Ohio | Dawson Funeral Home, Inc.
"May you rest in eternal peace"
"Helen was not only a wonderful person, but a very supportive mom to me. 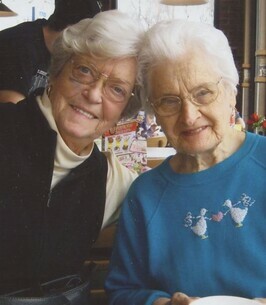 When I would call her she always knew what to say to comfort me...."
"She was my second mom just a wonderful person , love her always, Fred"
Pittsburgh, Pennsylvania – Helen E. Tipton, 91, of East Liverpool passed away November 7, 2018 at West Penn Hospital in Pittsburgh, PA.
Helen was born July 6, 1927 in Erwin, TN a daughter of the late James C. and Lydia Tinker Christy. 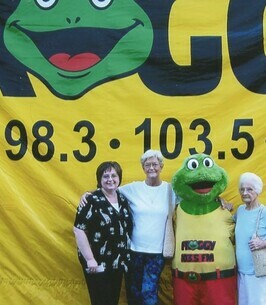 Helen was a charter member of Northside Community Church where she made muppets and performed many muppet shows for the kids at the church or anybody that wanted to enjoy her talents. 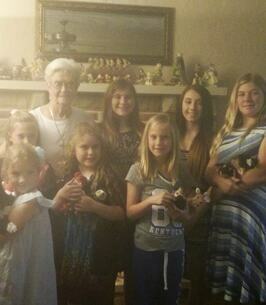 She was a member of the Scarlett Threads Red Hat Ladies Chapter where her dog Sadie was the mascot. Helen and Sadie also visited many area nursing homes where they performed for the residents bringing smiles to many people’s faces. She was full of life and endless energy and enjoyed going on any and every adventure she could with her family and friends. Preceding Helen in death were her husband, whom she married on September 19, 1949, C. B. Tipton and her son James N. “Jim” Tipton. Surviving are her two daughters Christine (Sam Pinkerton) Tipton of Erwin, TN and Deborah Martin of Unicoi, TN; granddaughter Kelly (Kenneth) Davis of Tampa, FL and great granddaughter Klara Davis. Friends may visit Sunday afternoon and evening at the Dawson Funeral Home where the family will be present from 2 to 4 & 6 to 8 p.m. Pastor Larry Rose of the Northside Community Church will conduct a funeral service Monday 1 p.m. at the church. Following the service, friends and family will gather at the Northside Community Church for fellowship. Burial will be at Spring Grove Cemetery where Kenneth Davis, Jack Howard, Bill Loy, Randy Barnard, Fred Parfitt and Marc Cicone have the honor of serving as pallbearers. In lieu of flowers memorial donations may be made in Helen’s memory to Northside Community Church, 702 Orchard Grove Avenue, East Liverpool, OH 43920. 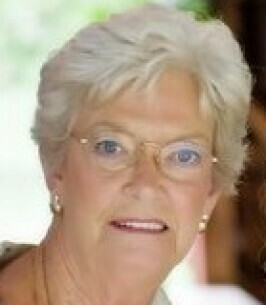 To send flowers to the family of Helen Earnestine Tipton (Christy), please visit our Heartfelt Sympathies Store. I was so shocked to hear of her passing! I JUST saw her a few weeks ago at the store, with her big smile, and a "Hello, lady!" She was a favorite customer of mine when I worked at Big K, and I like to think we were friends. I had been gone from Big K for 7 years now, so I was tickled to see her. And then this.... Wow... SO stunned. She will be missed. May God be with all of the family, and be proud of who she was. She was one of those rare gems, for sure. Helen was not only a wonderful person, but a very supportive mom to me. When I would call her she always knew what to say to comfort me. She would come to TN to stay with her daughter, Deborah every winter and I always looked forward to seeing her and spending time with her, even if it was just to take her to an appointment. We always found time to have lunch, talk and laugh. I will miss her so much. There will be a void in my life, knowing that she won't be there for me to pick up the phone and call her or spend time with her when she comes to TN. Heaven is gaining a wonderful angel. She will be truly missed!!! May God Bless her family!! LOVE YOU MOM HELEN!! Dear Christine, Deborah & Kelly, I am so sorry to learn of your loss of a most precious mother and grandmother. Losing the one who was the underpinning of our own lives is so hard. Please know that I'll be praying for all your family as you celebrate Helen's life and grieve her passing. May our Lord comfort you in a special way. With much love to the three of you who made an impact in my life.